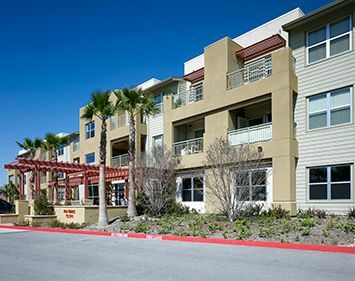 Palm Terrace II Co-op is the second phase of our development efforts in Ontario in conjunction with the City of Ontario’s Redevelopment Agency. It is three stories and has 48 units. Its basic features mirror that of the first phase with carports, lots of indoor and outdoor common area spaces that allow for constant member interaction, and individual balconies/patios that offer a majestic view of Mt. Baldy and the San Gabriel mountains. Having opened in May 2009, it is one of the newest and most attractive co-ops added to the CSI Support & Development family. Palm Terrace II Co-op Apartments does not allow smoking in any common areas, and within 25 feet of the building. Resident members enjoy the peace and privacy of their apartments, but also enjoy participating in the frequent community activities. Come join in on potlucks, gardening, Nintendo Wii or just relaxing with friends. Palm Terrace II is located just south of the 10 Freeway and is only minutes from the Ontario International Airport. The Co-op is affordable for everyone. Every unit has subsidy and resident members pay only 30% of their income for rent. So don’t wait! Join us today! Palm Terrace II Co-op is proud to be recognized as a NAHMA Communities of Quality Corporate Partner. This designation is for multifamily properties that have achieved a high standard of excellence in the way they are managed, the services they provide residents, the experience and training of personnel, and other criteria.